SENSEI KEITH GEYER 7th Dan. Interview By Robert Sachs. BECOMING UNATTACHED. By Mike Clarke. LESS IS MORE, SOFT IS STRONG. By Avi Rokah. AN ALTERNATIVE ZENKUTSU-DACHI.By John Cheetham. MASTER MITSUSUKE HARADA. Interview By Jonathan de'Claire. HACHI HO KUMITE. By Geoff Dixon. In SKM issue No. 94, there was a terrific article by Colin Smith detailing the gruelling training regime in South Africa under the guidance of senseis Stan Schmidt and the Geyer brothers, Keith and Derrick. Sadly Derrick Geyer passed away in 2007. 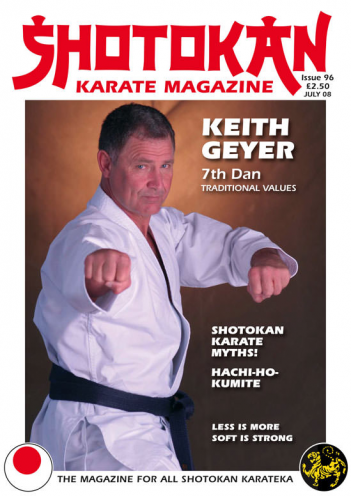 In this edition we have an exclusive interview with sensei Keith Geyer, arguably the most talented all-round karateka to emerge from South Africa in the last 25 years. Keith was graded up to 7th Dan by the JKA (Japan Karate Association) after physically taking this particular Dan grade examination in Japan at the JKA Hombu dojo. Quite an achievement by any standards! Sensei Geyer is best known for his brilliant fighting ability, power and technical skill. A couple of years ago I was given a DVD, called, "Winning Kumite" featuring Keith Geyer, which I had not really heard about or seen publicised. However, this was one of the best instructional karate (kumite) DVD's I had seen for ages. I'm not sure if it's still available but one of our regular advertisers (German Shotokan instructor – alias Schlatt, from Schlatt-Books, (www.schlatt-books.de) author of 'The Shotokan Dictionary', did originally publish and stock this DVD. It may not mean much to people outside the United Kingdom, but to be awarded the MBE (Member of The British Empire) is a remarkable and highly honoured achievement here in this country. Master Mitsusuke Harada (based in the UK since the early 1960's) the principal instructor to the KDS (Karate-Do Shotokai) has been awarded this prestigious award for his services to karate. 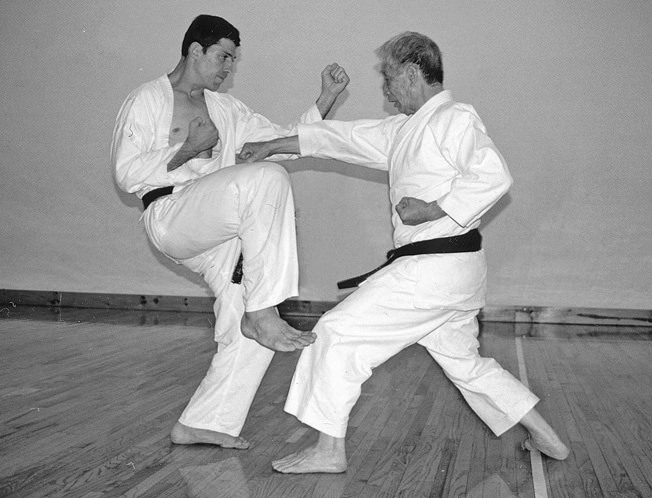 We have a great interview with Harada sensei, an eighty year old master, who's a veritable living history book of Shotokan and Shotokai karate-do. There was a lot of interest shown by readers regarding the karate-do film, 'Kuro Obi' (Black-Belt) which we covered in the last edition but unfortunately being a low budget movie it still has not been released in many countries and looks highly unlikely to get the type of world-wide attention, as for example, the 'Karate Kid' films, which is a great pity because the actual 'karate' is far, far superior. Hopefully it will come out on DVD. I'll keep you posted on this one! 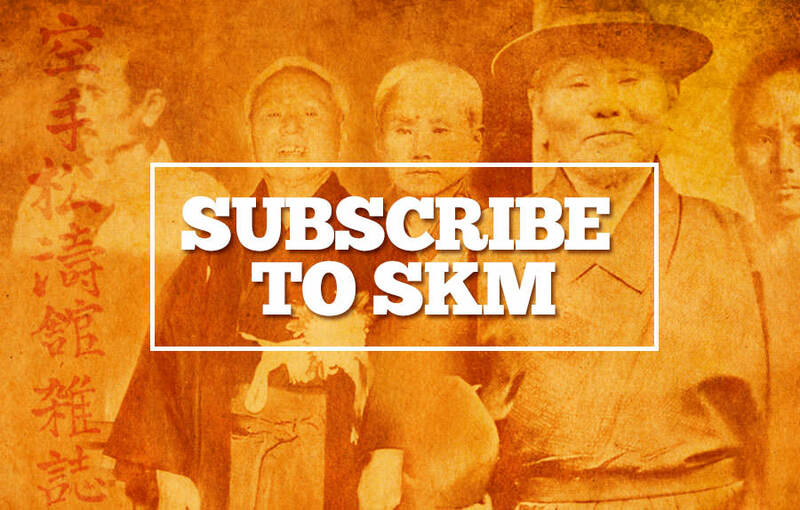 We have a new contributor in this issue, sensei Kousaku Yokota, a senior JKS instructor based in the USA who is writing a series of articles for SKM regarding what he believes to be the 'myths' of Shotokan Karate and there will be some controversial points discussed! In this first article he discusses his ideas regarding the use of 'hikite' and asks the question, "Is a good hikite necessary to make a powerful punch?" Many of our (Shotokan's) critics have asked why the majority of Shotokan practitioners and most instructors still use and teach a very exaggerated form of zenkutsu dachi (forward stance). A long, deep stance will suit some people and a much shorter version will be better for others. As my article suggests, with experience you will eventually arrive at karate stances which suit your own body. Less is More, Soft is Strong, spirited but calm, the right measure in everything. We cannot measure exactly how soft or strong, how much tension and relaxation, we cannot measure exactly how much spirit and how much calmness are ideal, it is a matter of experience, understanding, repetitions, sensitivity and proper teaching that brings mastery. Karate principles can be confirmed by science, but karate goes beyond calculations and formulas, it is an art. It says: “Mastery is not in what you can see, which is obvious, and not in what you cannot see, it is in mystery, in the in-between.” Someone’s action can be in perfect form yet boring, someone else has less than perfect form but you are drawn to him, you cannot take your eyes off him, and you cannot point at why. In karate as one becomes more skillful, one has to know when and where to be soft and when and where to be strong and powerful. One has to know when to be yielding and patient and when to be spirited. Within the softness there must be the right amount of power, and in the power the right amount of softness and gentleness, in the yielding there is always potential attack, and when the spirit is strong there is awareness and calmness, when I push my opponent and am aggressive I must always be ready to react, the defence is within the offense. That is the way to fight by skill and not by force and overpowering an opponent, as long as one relies on strength and power, this is not true martial art, there will always be someone stronger. The point of martial art is the weak overcome the strong, or use less strength and effort to overcome bigger power. So I think that most karate people have to learn to do less, not more, both mentally and physically. Most people think that they have to do more and more to get better, but the truth is that we have to learn to expand less mental and physical energy in our techniques and when facing an opponent in order to get better. In most cases we have to do a lot of undoing and in some places we obviously have to do more, in other words the real skill in karate is to know the right measure. Sensei Nishiyama (right) who is 80 years old, is not getting stronger, but the quality of his movement is constantly improving. Avi Rokah (left). I look at my technical training 20 years ago comparing to today, 20 years ago it was all about moving stronger and faster, of course I tried to keep good form, but energy was spread all over the place, now, I try to make all the energy that I expand to be useful. Power needs direction, otherwise it has no use, so I try to sequence the body segments correctly, I try to stay soft and avoid contradictory energy or extraneous energy in the technique. This way one can achieve more force, more speed and power with less effort. There is a term in sport science that is called optimal strength, which is the ideal amount of strength for the purpose. At the beginning levels in karate technique, a person’s challenge is in making maximal contraction at Kime – moment of focus; teach the nervous system to recruit more motor units in a shorter instant to make shocking power. As a person advances it is much harder and more challenging to keep the body soft in between kime to kime. The softer, more relaxed, yet without collapse, looser of postural integrity and stability of spine and joints, one becomes, the greater the potential contraction at kime. The contraction too, must have a delicate balance and sequencing, it has to be from the inside outward, from the spinal muscles, and then the bigger outer core muscles and to the technique line of energy, it has to be from the ground up in most techniques, and from the extremities to the ground in some techniques, such as pulling, sweeping. We say that the power of karate comes from softness not rigidity, because softness has more potential for contraction, we need to use softness and strength at the right times and places. If I look at the way I fought 20 years ago, I understood the importance of timing, but all I wanted was to go through the opponent and win, it was obviously a conflict. Now, it is more of a game, can I tune to the opponent? Become very sensitive to him? Can I play and control the distance in a way that the opponent can never hit me but he always feels threatened and uncertain? Can I cause the opponent to expose a space, a chance? And then can I be fully committed and spirited and give it all with no hesitation? And within this commitment can I still have awareness, monitoring of the situation and options, can I be committed but not blind and mentally rigid? At the beginning it is easy to learn to be spirited and committed, but it is more difficult to yield, to be patient, to make the opponent attack, to allow him to attack, and to handle it calmly yet with full commitment. Of course some experience is necessary; one must be confident in the ability to handle any attack in order to allow the opponent to attack. At the beginning levels of kumite (sparring), it looks like whoever attacks first has more chance, but in advanced levels the one who attacks first usually loses, if both sides are equally skillful. When facing the opponent many people look too tense mentally and physically, which makes them not responsive, not lively. If you are mentally tense, it is hard to read the opponent, to be sensitive to any change in him, and it is hard to make the quick instant decisions that are needed. If the body is tense we cannot respond quickly and smoothly, we are like a piece of wood, and we must stay flexible and lively. Karate fighting should not look like brawling, it should rise above that, the timing of karate is very superior, but it is up to each person to develop the mental composure to apply this timing and distancing. So a person must be with strong spirit but not become over spirited, he should be calm and patient but with strong spirit within, on the attack he should be spirited yet not blind, have quietness within, being able to observe and monitor the options and changes even while giving everything. In tai chi, it is described as a needle hidden in a cotton ball, be soft with the potential to explode and express power at any instant. When a person is like that, the opponent will always feel uncertain, in danger. Chen Mang Ching, the famous Tai Chi master said that one has to invest in lose, this is beautiful but who comes to karate to lose? Well, you have to give up in the short term in order to gain in the long term, follow the means and don’t be an end gainer. This concept of balance, of soft and strong in the right amount, of spirit and calmness in the right amount, is also important in the way one trains. One has to push himself to the limits, have maximum intensity in training, but also know when to train softly, when it’s time to develop the sensitivity to what your body is doing; develop the wisdom of the body. In my training, there are times that I work at full speed and power, and there are times that I train slowly, to check that I am on the right track, and don’t fall into bad habits. I see many people that train hard but the quality of their technique never changes, actually bad habits are magnified, and when this kind of person gets older his technique will deteriorate as the muscles weaken. Sensei Nishiyama who is 80yrs old, is not getting stronger, but the quality of his movement is constantly improving. For example, I check that my stance and my body dynamics fit my own body, that my feet position and the way the feet are loaded is not limiting the movement of the hips and therefore creating stress in my spine and compensations at the shoulders, that I am not forcing anything that can create injury and reduce efficiency, I check that my breath initiates the technique, that my breath controls the muscles around the spine and from there energy increases to the torso and rest of the body, I check that I fully use the ground and energy does not leak in my ankle, hips or any joint along the kinetic chain. I check that all segments move in proper sequence, that there are no compensations. Those kind of points need to be checked slowly once in a while, and then speed should be increased only as much as one can keep the coordination. Also, in kumite, I am not always going all out, I will go softly to develop the awareness of reacting from the breath and feet, to make sure that I am not forcing my techniques, but using them in proper timing with ease, to make sure that I am not doing things in the convenient, habitual way, but according to the right principles. In your technique, in your sparring and in the way you practice, develop a balance between strong and soft, spirit and calmness, hard training yet sensitivity in your movement. (Part Two next issue).